GOBOCLIP expands gobo projection with indoor/outdoor use. Its fully weatherproofed (IP55) ultra compact body can withstand high and very low temperatures, as well as water. Utilizing the CDM-SA/T 150 watt 9000-hour metal halide lamp, GOBOCLIP projects a bright and accurate rendition of any graphic design or logo. 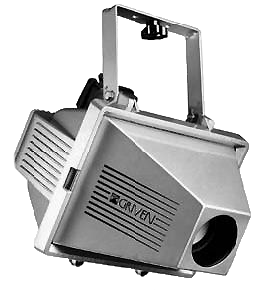 A zoom facility combines with two inbuilt projection angle options to provide maximum flexibility with projection distance and image size. GOBOCLIP has easy and quick gobo or dichroic filter change, with the rotating image speed settings, the focus and the zoom selection being similarly straightforward.